After making soaps for so many years its hard to imagine that I would still love it so much. Not only loving the creative side of soap making, but also loving the way my skin feels when I use my creations. Last evening I made a batch of soap that I hoped would remind me once again of why I love being a Soap maker. It accelerated very fast and rushed into the gel stage. Causing the design I had put on the top to smash against the top of the lid for the mold. I literally had to hold it down so the pressure didn't push the lid off and I didn't have a volcano of soap all over the counter. I placed the wooded mold filled with soap in the stove and left it over night. Got up at 6:45 am to unmold and cut the soap into loaves and then into bars. It was as hard as a bar of cured soap that has been sitting 6 weeks. Since it was unscented I couldn't only smell Shea Butter and Cocoa Butter. Which was Perfect. YES, I took a bar and went to the shower. It was pure BLISS. I got the feeling all over again. I know why I love being a soap maker and I stand by my product. 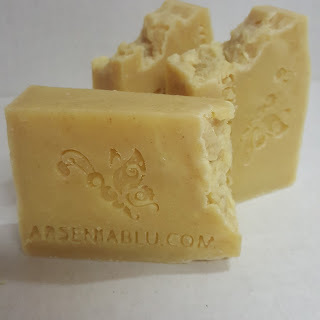 I make luxurious bars of soap and natural skincare as well as hair care that nourishes and moisturizes even the roughest, driest, most irritated skin. No don't get me wrong. I don't need to be reminded why I do what I do because I'm sold out and dedicated to the art of soap making. But more so to providing health skin care solutions that promote healthy skin. The batch of soap I created yesterday was made with Raw Unrefined Shea Butter, Raw Unrefined Cocoa Butter, Organic Coconut Oil, Palm Oil, Organic Coconut Milk Powder. No fragrance, No essential oils. Purified Water and Sodium Hydroxide. That's it, that's all, nothing else. It needs no preservative and gets no preservative. It's pure goodness and for me because I know exactly what's in my soaps Its Pure Bliss, plain and simple. Below I want to show you how much soap would be wasted if I chose to bevel this bar of soap to cosmetic perfection. The bar shrinks in size and the logo would no longer have fit. The extra layers having been peeled off now have to be stored or discarded. I choose not to do this for this batch of soap because it makes absolutely no good sense to change the natural and most realistic presentation of a handmade bar of soap in all of its rustic beauty. So I hope you enjoy this luxurious creation with all its skin loving moisturizing goodness. © 2015 Arsenia Blu Beauty. Felicity Template designed by Georgia Lou Studios All rights reserved.